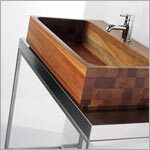 The Structure is a minimalist design approach to the bathroom vanity. The framework is constructed of stainless steel, and the counter top options include both solid surface stainless steel and wenge wood. The basin sinks, available in beatiful, rich mahogany or clear 1/2" thick glass, rest on top of the counters to create a dramatic statement. The Structure is available in two sizes: 471/2" x 20 1/4" and 39 3/4" x 20 1/4", and the basins ar available in 29 1/2" x 17 1/2" square.